“The argument that the N5000 bill should not be introduced because it would spur corruption does not hold because those that are using our currency for corruption have already migrated to the dollar because the naira has lost its value. The dollar has now become the store of value. That is why we are introducing a higher bill of value because we don’t want to dollarise our economy. We need to be in charge of the money that comes in and goes out”, says Nigeria’s central bank chief, Sanusi Sule Lamido. Reacting to this statement in a documentary publicized on NTA Newsline last week Sunday (September 9, 2012), Nigerians, in no unclear terms, expressed outrage and indignation over the proposal by the Central Bank of Nigeria (CBN) to introduce the N5,000 note. From the market women to the artisan, civil servant, bus conductors, members of the judiciary and the legislature, business leaders, financial analysts and so forth……they all chorused a resounding NO! Amid all the uproar, all-time-high heavy spenders like Alhaji Aliko Dangote have endorsed the CBN’s proposal to introduce the N5, 000 note and coin smaller denominations: N5, N10, 20, and the N50 notes. The Bankers’ Committee has also lent its weight behind the new currency regime. Speaking to newsmen after the committees meeting in Abuja, the Managing Director of the United Bank for Africa, Philip Oduoza said that the move by the Central Bank of Nigeria (CBN) will not in any way affect the nation’s economy as currently speculated. Victoria Ibezim-Ohaeri To end all that hullabaloo about the N5,000 note, i propose this LIVE and LET LIVE currency structure: CBN can go ahead and introduce the N5,000 for high-end spenders, and shelve the idea of coining N5, N10, N20 and N50. This works for me, and many others, i suppose. Austin Styno I think FG should make a gold coin that has an equivalent value of N5, 000. Let’s see how many rich people will carry those coins in their pockets! Alaka Olabisi All this grammar about the proposed currency is unnecessary after all. Looters do not spend naira; they spend in foreign currency. So let them have the N5000, but leave our N5, N20, N10, N 50 alone. Oluwaseun Temitope Ayelabowo We don’t want the N5000 note and the coins. There is nothing like big-spender but discrimination. We must stand as one people. Its now or never. Remi Adeoye Truth is it is cheaper in the long run to mint coins than to print paper notes. This stems from the durability of coins. The fear that those denominations may go extinct may not materialize because the average Nigerian cannot afford to forego a N50 change just because he doesn’t like coins. Mistake of the past was that coins were made from precious metals and it was profitable for blacksmiths to mop up coins and melt for use in making ornaments! Second, they were heavy to carry. If CBN has learnt from this, I expect the coins to be made from light and cheap metals. Such that it would be unattractive for use other than as a medium of exchange and they would be easy to carry. Finally let the denominations exist in both paper and coin form for at least two years and let us see the impact and acceptability of the coins before we go ‘paperless’. Ernest Brisibe In the Nigeria of today, coins are nothing other than raw materials in the hands of blacksmiths for making trinkets etc. Uriel Uzo Okoroma Its a big shame how people whom you’d have expected to know better have gone to town calling the policy self-serving and ill-conceived. Some even went to the extreme by tagging it “satanic and demonic”. But seriously, fears about N5,000 note are unfounded. They are only speculative and not based on real time economic indices. The problem we have as a people is that we have become so disenchanted with government and its policies that we have set “criticizing anything from government” as our “default mode”. If we can be honest with ourselves, the CBN has outlined the gains of this policy on our economy. In contrast, all the opposition has been based on distrust and societal suspicion against government that has grown over time. Like the CBN said, and I am yet to see anyone come out to dispute it; when 1000 was introduced, inflation actually came down. It means therefore that inflation has no corollary with introduction of higher denomination; but we don’t want to hear that because we already have a mindset on the issue. Doctr FoxWhy has the CBN chosen to create a N5,000 note? If the idea is to reduce the cost of printing currency notes of lower denominations, why not just make a N10,000 note? The coins will only work if they are light weight enough and have devices that are built to accept them like vending machines and similar. Tunde Akogun Who are these heavy spenders? Is the CBN not introducing currency apartheid? Oluwaseun Temitope Ayelabowo Anyone who accepts the big spenders’ theory is against the Nigerian masses. This is modern apartheid. Open your minds Nigerians. Obi EzeWhen people say “it is cheaper in the long run to produce coins”, are they counting the cost of low-end businesses that will be lost as a result of the coins going out of circulation due to non-use/non-acceptance? Are they counting the cost of producing the coins that will become near obsolete? Philips Akpoviri: Methinks – and vehemently so – that the implementation of this new currency regime should be preceded by a cocktail of some aggressive social-economic re-orientation to correct the negative apathy towards coins; and some firm measure of commodity pricing regulation to checkmate the arbitrary approximation of commodity prices to the nearest ‘big currency’. Then, one more observation: when Nigeria-based Nigerians go to the States, the UK, Korea, EU, etc they treasure and spend coins, why do these same fellows behave in the reverse order when they return to Nigeria? Oluwaseun Temitope Ayelabowo CBN tells you 5000 note is for big-spenders. Ask yourselves: who are big-spenders? We are docile and marginalized people. They are separating themselves from us. We attend Nigeria curriculum schools; they are attending British and American ones. They go abroad for treatment. How many of us travel abroad for treatment? Debbie, a breast cancer patient is in great need of 6 Million for her to survive. Do you know how many Debbies we have lost? The only thing we use in common is our currency. Now they want a separate us further with the currency notes. Think Nigerians! Arugha Etuwewe What level of opposition will stop the CBN from introducing the N5,000 note? The government is broke. It is clear to the discerning. They have borrowed; they have increased treasury bill releases; its just that no one is buying because Nigeria is broke. So, the aim of introducing the higher denomination notes is to cover up the fact that the country is broke. The country is stealing more than it is earning. Its like a pack of cards, one day, it will come crashing down, except the government takes measures to stop deficit budgeting, corruption, harness other resources and as well, diversify the economy. Oluwaseun Temitope Ayelabowo No level of opposition will stop CBN. But a united people, called Nigerians, are the only ones that can stop CBN. Let it start from Kano, the home town of this scenario planner. Northerners should protest against Sanusi and the southerners against GEJ for accepting this apartheid currency note. Mopileola Amusu What level of opposition will stop CBN? Does anyone really think the protest of ‘Nigerians’ will change anything? In my little understanding of economics, a ‘broke’ government has 3 options to raise money: increase taxes, increase borrowing (loans, Treasury Bills), and print new notes. Of course the long-term and more rewarding option is to tap other ‘resources’ and diversify the economy. The sublime statements of Okonjo-Iweala in recent times have raised the issue: Is Nigeria broke? The managers of our economy have dealt extensively with taxation. They have borrowed, so why not print new notes? Think on it! Ify OkoyeThey should make N5000 coin or leave us the way we are. Prices of things are already up. What was the point of “the cashless policy” if N5000 was going to be introduced? Monies were spent on media telling us why we must go cashless and just as people are getting ready to adjust, CBN is now wasting more money on the media to convince us why we must use N5000. Why spend tax payers monies recklessly? Remi Adeoye I think there are lots of misconceptions here. Now I agree that what man does not understand, he condemns! 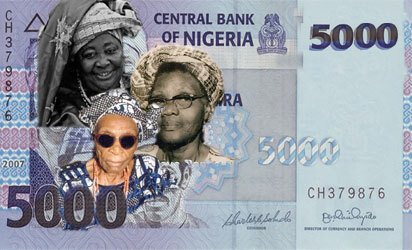 It is a misconception that the introduction of N5000 note amount to apartheid policy. Those who hold this view should look up what apartheid is in the dictionary. It is a policy of exclusion and segregation. It will mean some people are forbidden from spending or receiving payment with the note. Is that the intention? Of course not. If a nightwatchman earns N10,000 a month, will there be a law that says he should not be paid with two notes of N5000? So let us bury this apartheid talk. I heard someone said they should coin N5000. Remember that denomination will be the currency for business. If N5000 is in coin you would need a tow van or a crane to lift a trunk box filled with the money. So Central Bank will have to place order for special aircrafts to distribute currency to its branches across the land. For those who think the currency is demonic or satanic, what can I say? That is indolent thinking. They should wake up. But strict commodity pricing or price control will not work in a free economy. It will lead to scarcity of essential commodities and create a black market. Ify OkoyeThis is the same reason that we were told when N1000 was to be introduced. Till today, coins are only used in some parts of the North. Yes, I use coins when I am outside Nigeria because there are places to spend coins. Please let the promoters of coins name the places and cities where coins are spent? We have more problems facing Nigeria than N5000 note. When are we going to start setting our priorities as a nation right? I don’t know if you have been to the market recently and if you have not, start today to keep track of prices. Just as Sanusi didn’t think through the cashless policy, he is doing same with the N5000 note. Uriel Uzo Okoroma Furthermore, does a cashless economy mean currency notes won’t be in circulation anymore? Of course not. Banks still move monies around even in Lagos where the cashless policy is being test run. After 10 months, the CBN, I am sure, must have realized that the cashless move was a bit too hasty. It needs power (electricity) to drive it which is non-existent. I can count how many times I be tried to use a POS terminal and it was out of service. So, are we really going cashless? All this talk of we have other things to worry about other than introduction of new notes is funny. Sanusi is only the CBN governor and not the president. He is playing his own part towards nation building. The Chief Executive Officer, Financial Derivations Company Limited, Bismarck Rewane, is of the opinion that the plan to introduce N5,000 has overtaken the cash-less policy being pursued by the CBN. Another expert and Registrar of the Institute of Chartered Economist of Nigeria, Mr. Peter Ikpamejo, argued that the N5,000 bill would lead to an increase in the prices of goods and services. “Somebody should caution the CBN governor because the N5,000 note will lead to inflation. We feel that he should have re-denominated the naira by removing zero and making N100 the highest currency,” he said. It is not only Ikpamejo, who believes that the N5,000 note will cause inflation. Opposition parties have condemned the new structure of the naira. The All Nigeria Peoples Party, in a statement by its National Publicity Secretary, Chief Emma Eneukwu, stated, “It is an established fact that the Nigerian populace is averse to the use of coins, and therefore, the decision of the Federal Government to convert some lower denomination notes to coins smells a premeditated agenda to further mop up cash from the nation’s space and whip the Nigerian people in the process…” – culled from a piece titled “5000 note: Another burden for the poor”. All these are shallow arguments without empirical facts to back them up. How is it that Nigerians do not like using coins, yet they used it from as far back as the 1940s to the 1990s? Kelechi Deca The mistake many of those who have decided to follow Sanusi is that there is nothing like real time economic indices. Economists over the years have been bamboozling us with all types of hypes and jargons to cover their tracks. It does not work with the human animal. You cannot effectively predict how people will react to any economic policy based on how they reacted before. In economics, history is not a good indicator of outcomes. The world is in the mess it is today because economists adorned godhood and started predicting what will happen right, left and centre to the extent that big corporations hired renowned economists to peddle lies on Wall Street until everything crashed. After they messed up everything, the same Oracle(Alan Greenspan) that said few years ago that markets are disciplined enough to self-correct which gave people the false confidence to relax have now accepted that they were all wrong. Nonso Odimegwu Ndibe Look back at the last 2 decades or so. Ever since the naira was coined, Nigerians seem to have lost interest in using them, preferring only notes. Has CBN ever bothered to know why? I assure you that d moment the N5, N10 and N20 are coined, they will join their counterparts in being consigned to the dustbins of history. Kelechi Deca Nobody has ever bothered to ask what happened to the Kobo. Our legal tender is Naira and Kobo since it was decimalized in 1973, but where is the Kobo? Even if it has no value, it should be seen. Some US coins have no value, even vending machines reject them; still it is used daily in giving people change. Kelechi Deca The structure of the economy is flawed. Equally and more flawed is the monetary policy. Have you taken a look at the divergence between lending rate and deposit rate? Have you bothered to know that the interest rate is an all-comers affair with different banks deciding theirs? If they get that one right, then we can talk about denomination. Focusing on denomination as if it is the most important issue is not only misleading, it is crazy. Why is it that we are not running an economy that is productive, still we spend a billion daily to import rice and wheat? Why is it that imported food items are cheaper than locally produced ones, yet we say people should patronize made in Nigeria goods. Basically, we are not focusing subsidies in areas we should: which is agriculture. How can we get more people to go into agriculture? How can we make it cheaper for food stuffs to be transported from where they are harvested to their primary markets? How can we ensure than food products are not wasted because we can’t preserve them? Why is the cost of production so high that even manufacturers prefer to import the generic of their products manufactured in other countries than to make them here. Take a look at the Close-up, Lux or Blue Band and many other products from Unilever, it is now either made in Ghana, or Cote d’Ivoire or even Vietnam.